Are you a worry wart? Do you think it’s normal to worry constantly? Do you feel that people who don’t visibly look worried about things just don’t care and live in a lala land? Do you scream at other drivers during rush hour? Do you yell out at the subway attendant when the train is delayed (I witnessed that one a few weeks ago)? Do you yell at your spouse when someone is coming over and the house is still a mess (yeah, I’ve done that…sorry Samit!)? If so, you’re definitely not alone. I’m not here to turn you into a weirdo that never worries. But if you don’t already know that worrying incessantly can lead to lots of physical problems down the road, I’m here to tell that’s just where you might be headed. If you’re already dealing with things like high blood pressure, anxiety, depression, insomnia, frequent headaches, digestive issues, etc., then you know what I’m talking about. These things aren’t normal and for most of those of them, you should probably seek out medical attention. But in addition to traditional medication, I would also suggest a few other techniques to the chill the F out! For this to work, you have to decide that you’re okay with worrying a little less. If not for the sake of yourself and your own health, than for the sake of your family and your wallet. If you’ve decided you need to learn to take it down a notch, here are some steps you can take. 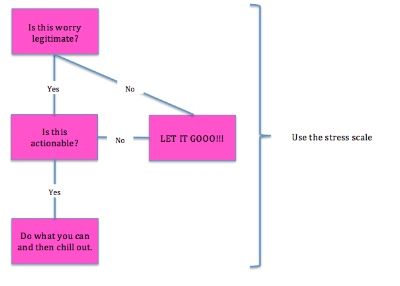 Use the stress scale. In any given situation, ask yourself, on a scale of 1 to 10, 10 being the absolute worst thing that can happen (like a viral apocalypse that’s killed everyone and left me alone and running from rabid, mutant animals), how bad is this situation? I guarantee most situations (like being late to a meeting or whatever) won’t break a 5. This isn’t meant to say that your problem shouldn’t matter. It just means that maybe your reaction, i.e. level of stress should match the level of severity of the situation. Figure out if what you’re worrying about is a legitimate worry. We all have legitimate and illegimate worries. A legitimate worry is worrying about something actually happening. Like a loved one in the hospital. Or worrying that your kid bit another kid in daycare. Or worrying that you won’t be able to make rent this month. You get the idea. Illegitimate worries usually have to do with ideas we are projecting onto the future. It usually goes something like this: I’m very worried about X happening because if that happens than Y won’t happen and Z will happen instead and then I’ll be left dealing with the mess. The reason worries like this are illegitimate is because humans can’t predict the future. I don’t care if you heard it from an astrologer or a psychic or whatever else, you have no idea what’s actually going to happen. There are literally infinity numbers of combinations and permutations that we are incapable of predicting. So stop thinking you have some special insight into what is going to happen. Don’t believe me? Think about the last time you worried about a situation…did it go EXACTLY the way you thought it would? Yeah, didn’t think so. Let it go! Get a change of scenery by going for a walk and getting a breath of fresh air. Start reading something interesting on your phone. Start taking deep breaths and counting down the length of the inhales and exhales. Listen to a song you really like. If you’re really ambitious, you can meditate. Whatever method you use, train yourself not to give importance to the worry-thoughts that aren’t real and/or you can’t do anything about. This habit will take time to get used to, but over time, it will get easier. If you’ve made it all the way down to the end, then I want to say thanks for reading. But I also want to add that these tips aren’t just some generic things I tell people. These are things I’ve been practicing for YEARS and have had a tremendous impact on me. I often hear from my clients that I have a calm presence, and a) that’s because my game face is ON, but more importantly, b) I really do these things all the time. Of course, any time you try and change your habits, you win some battles and lose others. And that’s okay. As long as you win a few.